Blogger has introduced new feature to Adding a Favicon to your Site. Favicon is small icon placed on the top of your browser address bar. Many of us don,t know about Favicon but today i will tell you how to set up your own Favicon. Favicon makes your site standout from others. It keeps your error logs neat and clean and on some browsers that have "tabbed browsing"(Firefox, Safari, Google Chrome), it helps identify which tab has which site in it. 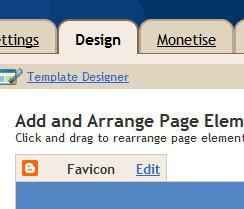 Below are some easy steps to adding a Favicon to your Site or Blogger. Your Favicon image size should be 10 kb or samaller and width of your image should be 16px and height of your image should be 16px. 2. Go to Dashboard --->Design--->Page elements. 3. Click on edit button placed on the top left of your page and upload your favicon and save it. If you have any problem about this topic then comment below.